The September 4, 2014 issue of the Troy Times-Tribune is now available. 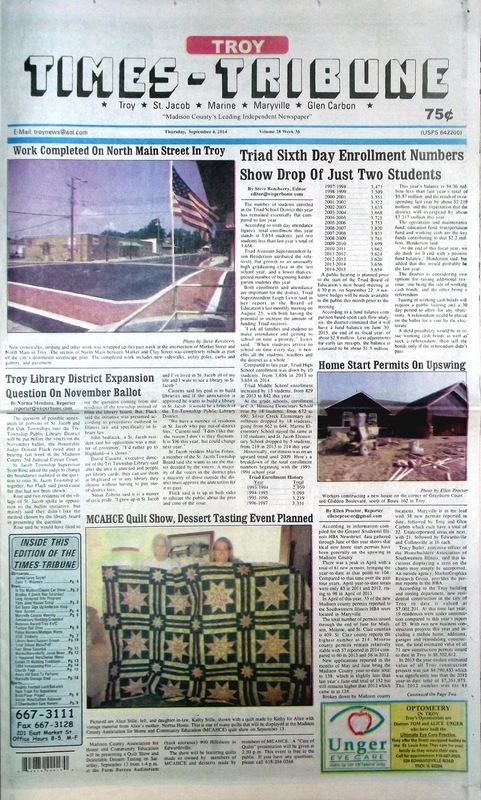 Some of the headlines in this issue: Triad Sixth Day Enrollment Numbers In, Troy Library District Expansion Question on November Ballot, Home Start Permits On Upswing, Quilt Show Planned, Bradley R. Smith Run is Saturday, Fall Fest Events Ready to Go, Drost Park May Get New Restrooms, Triad Football Team Overwhelms Mattoon; plus we have police blotters, a column about Triad stepping up the plate for the ALS Challenge, the weekly weather forecast, and plenty of other local and useful news! This issue has obituary listings for James Leroy Guyer and Joey T. Waymire.